The NanoSpace Molecularium is a nice educational game produced by Rensselaer Polytechnic Institute. It is available to play in a web browser and is available as an iOS and Android app. The purpose of the game is to provide elementary school and middle school students with an introduction to the properties of atoms and molecules. The NanoSpace Molecularium is a virtual amusement park that students can click through to find videos, games, and other short lessons about atoms and molecules. Students enter the NanoSpace Molecularium through the "Hall of Atoms & Molecules." From there students can choose which of the four parts of the amusement park they want to explore first. The four sections that students can explore are DNA Land, H20 Park, Sizes of Molecules, and Molecular Materials. Here's a video about the game. The NanoSpace Molecularium can be used by students with or without creating an account on the site. The benefit of creating an account is that students can keep track of where they left off during their previous visit. PhotoScissors is a free image editing tool that you can use to remove the background from your images. PhotoScissors is available to use for free online and is available to download as desktop software. To use PhotoScissors online simply go to the site and upload a picture that you want to edit. After you have uploaded your picture you will be taken to an editing screen. On that screen you use a green marker to indicate the parts of the picture that you want to keep and use a red marker to indicate the parts of the picture that you want to remove. You will see a live preview of your edited image while you work. If you remove too much, you can put it back into the picture by just coloring with the green marker. If you didn't remove enough, just do a little more red marking. When you are happy with your cutout image you can download it as a new image. I found PhotoScissors last night when I was looking for a free alternative to Remove.bg. I was looking for an alternative because of some complaints about the cover image on the Remove.bg website being a little too close to PG-13 for some users. It turns out that PhotoScissors is probably an overall better tool because you can use it for more than just pictures of people. You can use it for pictures of animals (I tried it with a picture of my dog), plants, and buildings. That's because you selectively indicate which parts of the picture to keep and which to remove. Students can use PhotoScissors in the same manner in which I outlined using Remove.bg to virtually place themselves in front of any landmark. Students can use PhotoScissors on a favorite selfie picture then use their cutout to place themselves in a picture of a famous landmark. 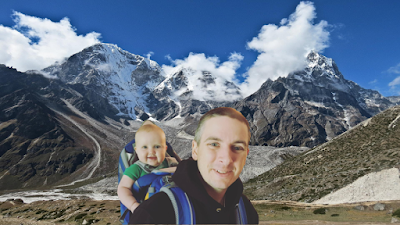 I did this last night when I put the cutout of my daughter and I in front of Mount Everest (see above). I made that picture by putting a picture of Mount Everest on a Google Slide then placing my cutout on top of it. I then downloaded the Google Slide as a PNG. This could be done as part of a social studies lesson in which students create a series of pictures of themselves in front of landmarks and write short stories about "visiting" each landmark. BTW, as many Twitter followers have pointed out, most versions of PowerPoint have a tool for removing backgrounds from images.